On the one year anniversary of the release of Pebble Time, Pebble has announced its successor: the Pebble Time 2. The Pebble Time 2 is a more refined and robust take of last year's Time, decked out in a stainless steel body and stocked with a built-in heart rate monitor. Pebble's latest high-end wearable is packed to the brim with even more improvements over last year's. But can it take on the likes of other, popular fitness-savvy wearables, like the Fitbit Blaze and Moto 360 Sport? Since its beginning, Pebble has launched its products on Kickstarter and the Pebble Time 2 is no exception. While most products on the crowd-funding platform offer up a foggy-at-best time frame for release, Pebble has nailed down November as the month when its Time 2 will be shipped out to backers. For everyone else? Early 2017. One of the bigger surprises that the Pebble Time 2 brings is its price of US$199 (£136, AU$277). If you're an early backer, you'll only spend US$169. What's cool (or saddening if you bought last year's model) is that you get the sleek stainless steel body of the Pebble Time Steel along with several welcomed additions for the same price. 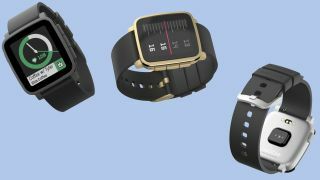 The original Pebble Time took the Pebble Classic, shaved off its edges and implanted a color e-paper screen. The Pebble Time 2 doesn't do nearly as much to reinvent the Pebble, but it kept what worked and, thankfully, ditched what didn't. The Time 2 has a brushed casing, which meets a glossy coating of stainless steel on the top of the device. Its bezels, which are Pebble's most divisive design feature, have been greatly reduced this time around. Pebble's latest features a similar color e-paper screen, but it's 50% larger and packed with 80% more pixels than the first Time. Flipped over, the new built-in heart rate monitor takes center stage. It's slightly elevated from the casing, likely to make–and keep–close contact with your skin while you're walking, jogging or doing anything that you'd like to track. Pebble Time 2 backers who enjoy taking a dip will enjoy the fact that the Time 2, like its predecessor, is water resistant. Pebble Time 2 will likely operate on Pebble OS, the proprietary operating system that runs on all current Pebble models. However, unlike today's Pebble devices, new additions will be made to put the new built-in heart rate monitor to good use. We'll have to wait and see whether Pebble will be adding more comprehensive fitness tracking capabilities for the Pebble Time 2, but given the new hardware capabilities, you can bet that we'll see some extended support for the fitness-focused. It's recently updated Pebble Health to make the APIs for things like step tracking open to all, as well as a new mood-sensing app, so that means all the smarts will be there at launch for the new wristpiece. In terms of battery, Pebble Time 2 has managed to hang on to its excellent battery life, which is somewhat of a signature feature for these wearables. You'll net up to 10 days without a charge. Like today's Pebble Time, the Time 2 will also feature a microphone for shouting texts out verbally. It's also possible that Pebble is expanding its voice support to trigger extra features on the new wearable. Along with the Pebble Time 2, Pebble has also debuted the Pebble 2, a follow-up to its very first Pebble device. Not content with the reveal of two new devices, here's a third: the Pebble Core. It's the company's first screen-less device and it looks a whole lot like the square iPod Shuffle, and offers built-in GPS and Spotify integration.